men-u Muscle Fibre Paste is strong, long lasting flexi-hold in seconds! Instant style in your hands with superb hold and separation. Use enough and you get a real lock to your style. Matt finish for well groomed to messy styles. 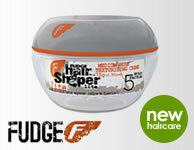 Lightweight microfibres bind and hair is pliable adding thickness & volume. Great for styling difficult hair and growing it longer - overcoming those awkward, flicky ends! Put small amount between palms and rub together well. Work evenly and thoroughly into dry or towel dry hair. Washes out easily and a little goes a long way!